Hundreds of Congress leaders and workers were arrested on Thursday for holding an 'Akrosh rally' here to protest against the demolition of many party offices in Tripura allegedly by the BJP government. The eviction drive was launched on May 7. The rally was led by state Congress president Birjit Sinha, former legislator Gopal Ray and other top leaders of the party. Police arrested over hundreds of Congress members during the protest rally. Earlier, Congress activists from various sub-divisions of the state conglomerated at the party office at Post Office Chowmuhoni to attend a meeting. State Congress President Birjit Sinha said the BJP regime has bulldozed democracy and opposition supporters and members are now at the receiving end. "We are annoyed and this is the outburst of our grievances in the form of Akrosh rally. Throughout India, BJP has destroyed the fabric of democracy and in Tripura also the BJP after coming into power has illegally demolished the party offices of Congress and other political parties. This is inhuman and attack on democracy," Sinha said. 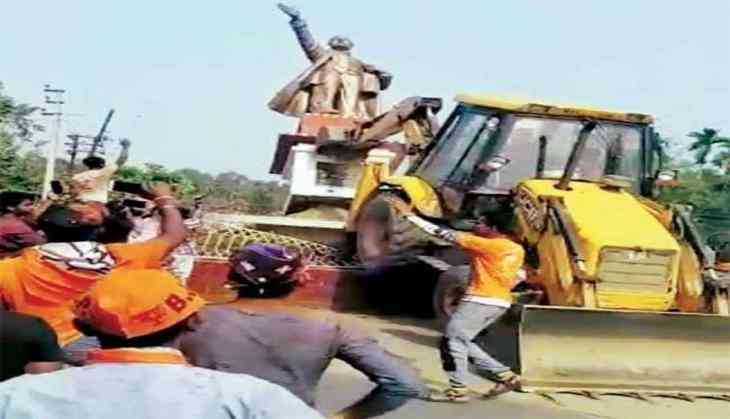 The Congress has alleged that the BJP-IPFT coalition government in the state has been demolishing party offices with political vendetta and without prior 'legal' notice. It had dubbed the BJP-led government's functioning in Tripura 'worse than the British rule'. Former Congress MLA Gopal Ray said, "People are not satisfied in India, people are not satisfied in Tripura. For all the grievances of the youths, employees, farmers, labors and all types of people, they are annoyed, not satisfied with this and all activities headed by Biplab Deb." "That is why more than 300 people from CPIM and BJP joined today. Thousands of people are awaiting to join Congress. We will start the movement throughout the state," he added. He added: "It is unfortunate that the government has cancelled our prayer for the Akrosh rally. It has been cancelled by the instruction of Biplab Deb or the BJP government. This is unfortunate." Trade union offices affiliated to various political parties including ruling BJP, Congress and CPI-M were constructed illegally on the government lands in Tripura.